As Australia’s largest privately owned OEM, Vawdrey Australia has set many a technology trend over the past 40 years. But if you ask Mick Vawdrey, the man who started it all, it’s the company’s committed workforce that continues to make all the difference. Flashback: On 27 September 1974, on the tail end of a gruelling two-week cold spell, Vawdrey Australia first opened for business in the Melbourne suburb of Braeside. While many in the industry are well aware of the success story that was to follow over the coming 40 years, the reason why Mick decided to start his own trailer building business is still widely unknown. In his early working life, Mick worked two jobs at once – by day he was a plumber, and by night he would drive tow trucks to generate an extra income. At age 24, he was involved in a car accident that left him a paraplegic, causing him to spend more than six months in hospital. After leaving the clinic, Mick had a choice to make – take up a job as an estimator for a plumber or join his old boss from the tow truck company in a new truck body building venture. He went for the second option and started off answering the phone and helping around the office. After only a few months, he took on the accounting of the business and within six months after leaving hospital, he was practically running the place. And yet, he still didn’t feel like he had ‘arrived’ just yet. Wheelchair or not, Mick sensed that his destiny would be somewhere else. Because of that characteristic restlessness – and with a then five-year-old son to support – Mick decided to go out on his own and start his own truck body building business: Vawdrey Australia was born. Entrepreneurship proved to be a tough line of work, though: In the beginning, Mick spent most of his days trying to sell his equipment, and his nights building it. Tied to the wheelchair, he relied on the help of his close friend Russell ‘Billy’ Baker during that time, who worked by his side 24 hours a day to get the business off the ground and ended up staying with Vawdrey for decades to come. 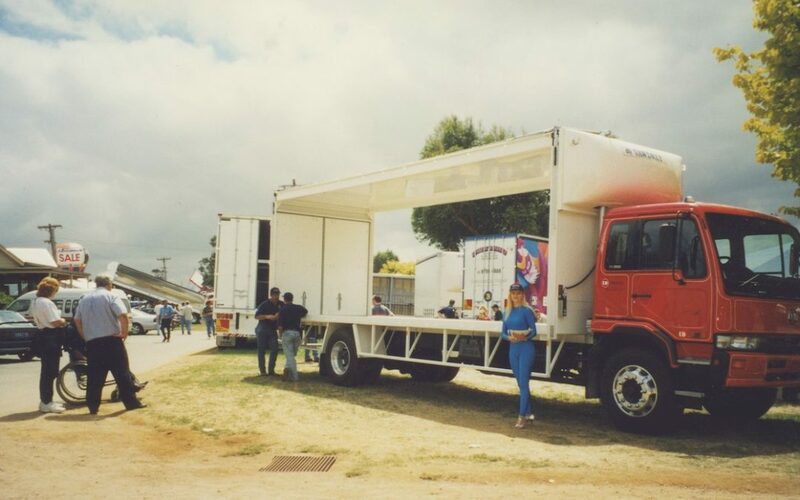 Since those early days, Vawdrey Australia has become an institution of modern Australian trailer design and paved the way for many a revolutionary technology we take for granted today. For example, Mick and his team pioneered the OH&S movement with the launch of an automatic mezzanine deck system and the development of an automatic buckle-less curtain almost a decade ago. Since 2012, Vawdrey also helped the much talked-about PBS scheme expand beyond the classic truck-and-dog segment and brought it to the general and refrigerated freight market – effectively helping Australia’s road transport community cement its reputation as the most progressive in the world. With that in mind, Paul and Mick have been working hand in hand to recruit a young and dynamic management team that will help steer the business into a successful future. “As Mick always says, it’s all about people. As such, we’ve built a fantastic team of strong leaders to ensure Mick’s ideals will be carried into the next generation of Australian transport,” Paul summarises.